Background: Diabetes Mellitus (DM), is a metabolic disorder characterized by high blood glucose levels. The main types of diabetes mellitus are Diabetes mellitus type I, Diabetes mellitus type II, gestational diabetes and Diabetes of other etiology. Diabetes type II, the Non Insulin Dependent Type (NIDDM) is the most common type, characterized by the impairment in activation of the intracellular mechanism leading to the insertion and usage of glucose after interaction of insulin with its receptor, known as insulin resistance. Although, a number of drugs have been developed for the treatment of diabetes type II, their ability to reduce blood glucose levels is limited, while several side effects are also observed. Furthermore, none of the market drugs targets the enhancement of the action of the intracellular part of insulin receptor or recuperation of the glucose transport mechanism in GLUT4 dependent cells. The Protein Tyrosine Phosphatase (PTP1b) is the main enzyme involved in insulin receptor desensitization and has become a drug target for the treatment of Diabetes type II. 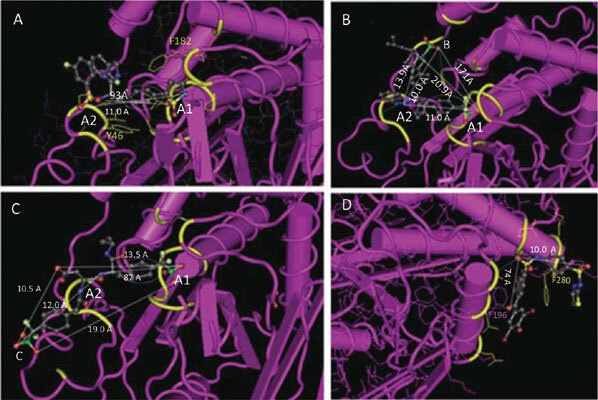 Several PTP1b inhibitors have already been found, interacting with the binding site of the enzyme, surrounding the catalytic amino acid Cys215 and the neighboring area or with the allosteric site of the enzyme, placed at a distance of 20 Å from the active site, around Phe280. However, the research continues for finding more potent inhibitors with increased cell permeability and specificity. Objective: The aim of this review is to show the attempts made in developing of Protein Tyrosine Phosphatase (PTP1b) inhibitors with high potency, selectivity and bioavailability and to sum up the indications for favorable structural characteristics of effective PTP1b inhibitors. Methods: The methods used include a literature survey and the use of Protein Structure Databanks such as PuBMed Structure and RCSB and the tools they provide. Conclusion: The research for finding PTP1b inhibitors started with the design of molecules mimicking the Tyrosine substrate of the enzyme. The study revealed that an aromatic ring connected to a polar group, which preferably enables hydrogen bond formation, is the minimum requirement for small inhibitors binding to the active site surrounding Cys215. Molecules bearing two hydrogen bond donor/acceptor (Hb d/a) groups at a distance of 8.5-11.5 Å may form more stable complexes, interacting simultaneously with a secondary area A2. Longer molecules with two Hb d/a groups at a distance of 17 Å or 19 Å may enable additional interactions with secondary sites (B and C) that confer stability as well as specificity. An aromatic ring linked to polar or Hb d/a moieties is also required for allosteric inhibitors. A lower distance between Hb d/a moieties, around 7.5 Å may favor allosteric interaction. Permanent inhibition of the enzyme by oxidation of the catalytic Cys215 has also been referred. Moreover, covalent modification of Cys121, placed near but not inside the catalytic pocket has been associated with permanent inhibition of the enzyme. Keywords: Diabetes mellitus, Protein tyrosine phosphatase inhibitors, PTP1b, Competitive inhibitors, Allosteric inhibitors, Covalent inhibitors, Selectivity. Keywords:Diabetes mellitus, Protein tyrosine phosphatase inhibitors, PTP1b, Competitive inhibitors, Allosteric inhibitors, Covalent inhibitors, Selectivity.